HP 1405A Plug-In Mystery: Which Is It? I’m fixing up an HP 143A Wide-Screen Mainframe Oscilloscope, which has a very big selection of plug-ins to provide a variety of functions. The oscilloscope has symmetrical vertical and horizontal circuits, so it can be used as an X-Y amplifier if suitable vertical amplifier plug-ins are installed in each bay. I’m looking to buy 1400-series vertical amplifier plugins like the 1402A, 1404A and 1405A and came across an interesting bit of a mystery while doing research. 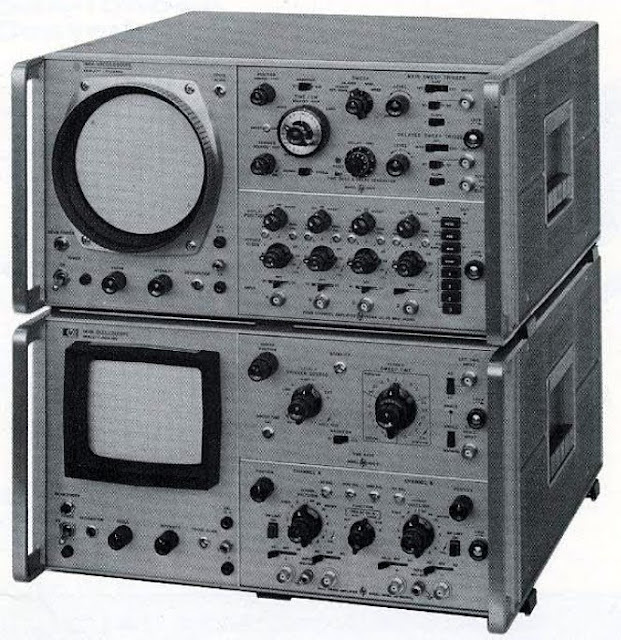 HP’s General Purpose Plug-in Oscilloscopes catalog for the 140 system, dated March 15th 1971, lists the 1405A dual trace amplifier plug-in as a DC-5MHz plugin with 5 mV/div sensitivity, more or less a down-rated version of the 1402A plug-in. 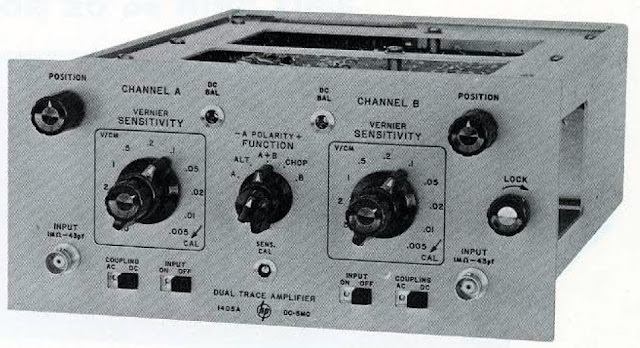 In my research I did find a photo of an HP 140B oscilloscope mainframe loaded with an HP 1405A amplifier plug-in…but in this photo, it’s a double height dedicated X-Y amplifier. This panel clearly fits in the double height 140-system plugin opening, and has the same style of knobs and controls so there’s no question it’s period correct. I’ve been unable to find any mentions of it on the web or at the HP Memory Project. Personally, I’d rather have a matched pair of 1402A or 1404A vertical amplifiers, which would give me dual- or quad-trace X-Y capabilities instead of the single-trace X-Y with the pictured mystery amplifier, but that’s a very interesting piece of equipment. I’m still looking for another 1402A, or a 1404A – if you have one for sale or know where I might find one, please let me know. 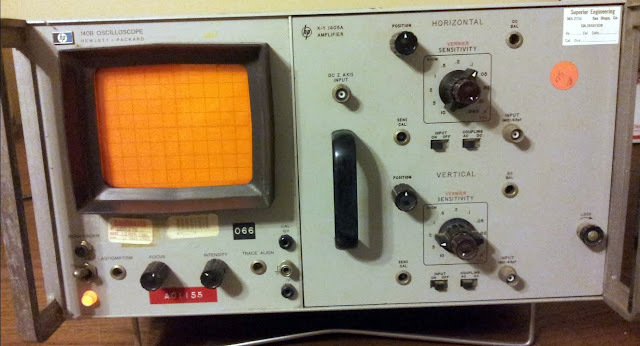 This entry was posted in Electronics, Gadgets, Photos, Test Equipment, Vintage and tagged hp 140 series, HP 1402a, hp 1404a, hp 1405a, hp 140a, hp 140b, hp 143a, hp plug-in oscilloscope, oscilloscope, x-y amplifier, x-y display. Bookmark the permalink. 13 Responses to HP 1405A Plug-In Mystery: Which Is It? 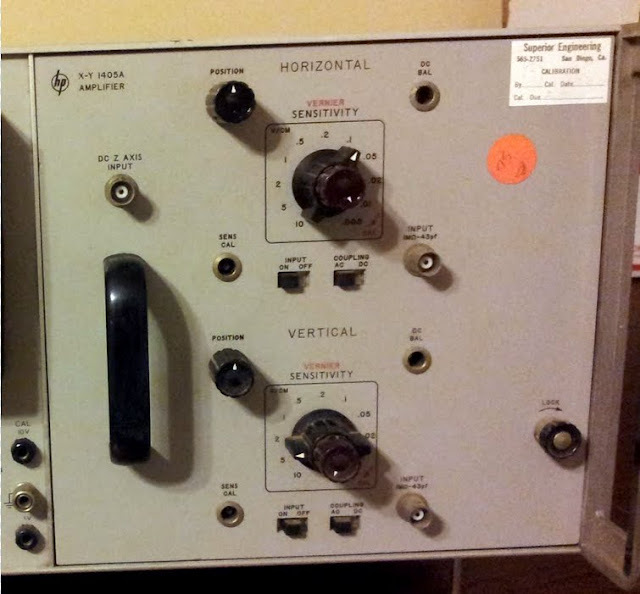 I have a lot of vintage electric test and much more equipment available …I’m based in the U.S.A.
Update on my 140T SA: The calibrator has been repaired and I learned something about tunnel diode square wave generators in the process. HP patented the design (#808,788). The low-voltage power supply of the 140T has a problem in the +250V section: the output is only 216V and the adjustment potentiometer has no effect. Both the +100V and -100V supplies, which affect +250V, are working correctly. I should have added that in this 140T, one of the later designs (s/n 1224A series), the low-voltage power supply uses only one neon lamp and that in the +100V supply, which is working correctly. So at least I don’t have that problem, as previously discussed. Update: The 110 MHz and 1250 MHz SA plug-ins both work fine. The audio plugin works but not correctly; I need to do some more testing, try to understand what is wrong. The mainframe works except for the calibrator; I have a tunnel diode on order so that will be repaired. Note that the mainframe is a 140T so is NOT a storage mainframe. You know what, don’t worry about the audio plugin – I’m going to pick up a 3582A for that, which will be better for my application anyway. I think I’d probably take just the 110 MHz and the mainframe. That’s a really unique plug-in—I’ve never seen one before but have a single 1405A in my collection. Looks very much like an ‘ET’ (Engineering Test) instrument, which HP manufacturing divisions made for internal use, although those usually have an ET-number on them. It was possible to buy a “blank” plug-in chassis so maybe an HP division or customer built it out of two 1405As. I have a 140-based spectrum analyzer that I’m thinking of selling. It uses a 140T mainframe, which has a rectangular CRT but does NOT have storage. Plug-ins are 8553L/8552B, 8554B/8552B, and 8556A/8552B. To be clear, each RF section has its own IF section—makes swapping so much quicker! I could sell the mainframe and one plug-in and the others separately, or the whole lot. Not interested in making a whole bunch of money, just running out of room and would like to find a good home for this stuff. Shipping will be expensive unless you can p/u in northern California. Interested? Good working order? I might be interested in the mainframe with the 1 kHz – 100 MHz plugin set, and maybe the 20 Hz – 300 kHz set, although my timeframe to purchase is probably in another 6 weeks or so to get some extra play money together. I would want to make sure the audio plugin works correctly (haven’t used it in some time) but the mainframe and the 110 MHz plugin are on the bench now and definitely work. I am not in a hurry to sell. While I’m curious about the audio plugin, I’m almost certainly going to get a 3582A for audio applications, so it’s not hugely important. I’d use the 110 MHz for alignments most likely. I’ll keep you in mind and get in touch next month! That’s fine. It will give me a chance to check everything out.